If there was ever an example of the stifling effects of the life+70 copyright period, it must be Eric Ravilious. Born on 22 July 1903 in London, and missing presumed dead after 2 September 1942, his prints and designs were popular and successful at the time. Although his watercolours were representative and showed few tendencies towards Modern Art, the critics (notably Roger Fry) were lenient with him, although he was relegated to the ‘second division’ in their view. Since his heirs’ copyrights expired in 2012, this is the fifth book containing his work which has been published, and the second attempt to survey his sadly abbreviated career. The previous account, by Alan Powers, encompassed his entire output, devoting many pages to his design work, prints, and illustrations, although it does contain a thorough chapter giving a chronological account of his watercolour painting. This book accompanies The Dulwich Picture Gallery’s current exhibition of Ravilious’s watercolours, the largest accomplished so far, with more than 80 paintings on display. It thus focuses largely on that aspect of his output, although it is by no means exclusive and retains context where needed. After a short Foreword and Preface to whet the appetite, Ravilious’s life and painting are summarised briefly in 19 pages. The emphasis here is on brevity: for example, his highly productive period as a War Artist is raced through in just over a page. However for those unfamiliar with his biography and influences this is probably just right, and avoids duplication of material already in Powers’ book. The book ends with details of previous exhibitions, a timeline, extensive notes, a good bibliography, and the usual end matter including a good index. The thematic sections consist of superb reproductions of the paintings in the exhibition, including some full-size detail views bled out to the edges of the page, together with brief commentaries on the works, the historical background to their creation, and some appreciation of their themes and puzzles. These are inevitably very selective, but make fascinating reading and enhance the images significantly. There is no attempt to locate every image precisely in terms of time or location, which is sometimes an opportunity missed. Because of my own background I have affinity with several of the paintings: for example, RNAS Sick Bay, Dundee (1941, p. 82) depicts a standard RN bedspread which I well remember from living in RN messes in the past, and has the sparse almost spartan look of accommodation which I too quite enjoyed at a rather later time. There are some superb paintings shown here. Among my favourites are two inside greenhouses, and most of his landscapes, particularly those of the South Downs. Russell includes his famous painting of the Cerne Abbas Giant, and remarks on its curious reversal of colour – a feature not commented on by Powers, but explained by neither author. Overall this book impresses in several respects. 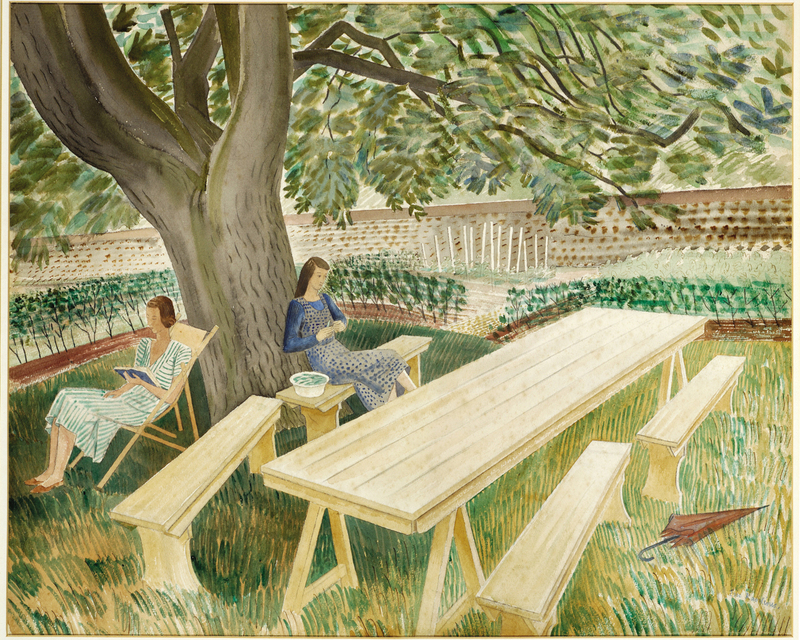 It shows how Ravilious was a great artist worth exhibiting, studying, and appreciating. It also demonstrates how he put rich textures into his watercolours, something that spilled over from his print-making, and this book is a collection of excellent examples of this for the modern watercolour painter. It also captures so evocatively an era in the UK, the years prior to and during the Second World War, with its empty but productive countryside, horse-drawn farm machinery and carts, and the growth of war machinery and spread of barbed wire. 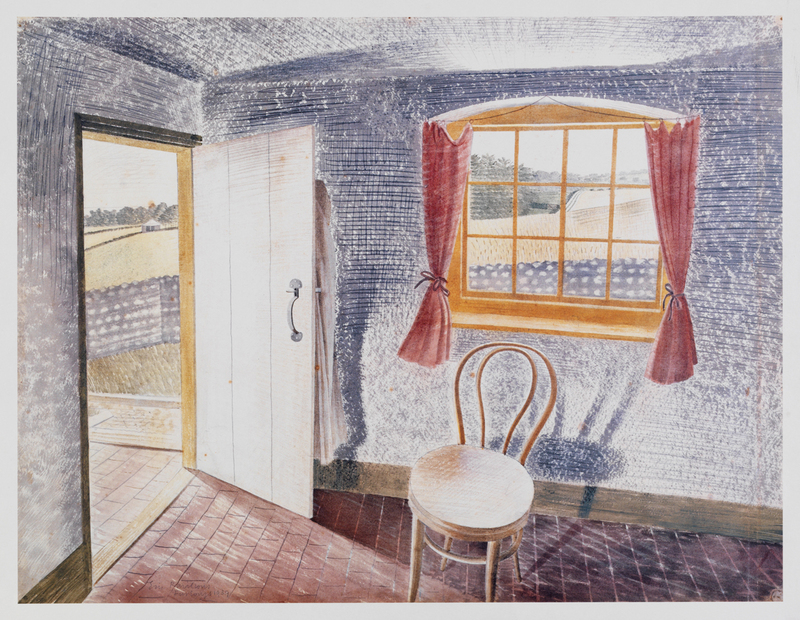 Ravilious’s wonderful watercolours capture a deserted Tea at Furlongs, laid for two, just at the outbreak of the war which was to cost him his life. This book is an excellent complement to that of Powers, and I am delighted to be able to enjoy both. If forced to choose, I think the better illustrations in Russell’s book just have the edge, and I hope to get up to London to see the exhibition during the summer. 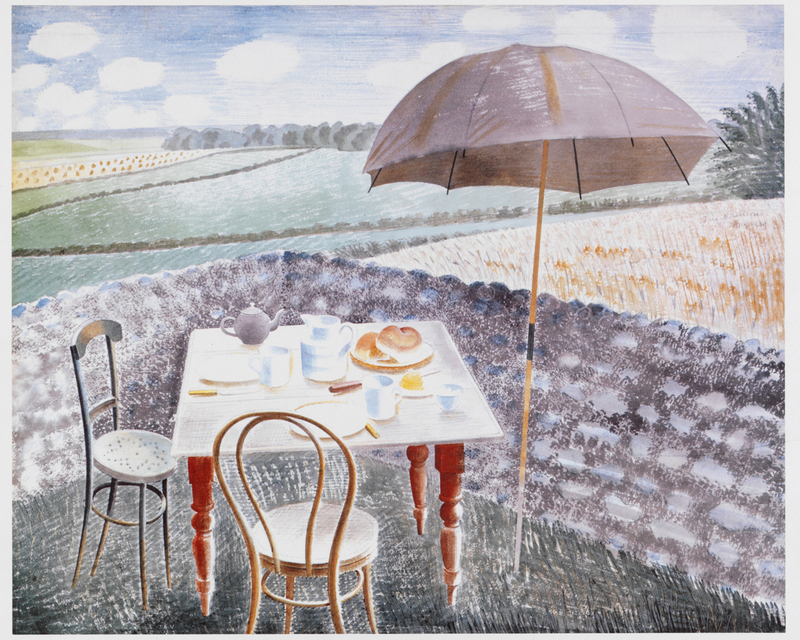 Over 80 of Ravilious’ watercolours are currently being shown in an exhibition at Dulwich Picture Gallery here. This opened on 1 April and runs to 31 August 2015. He does not yet have an entry in WikiArt, surprisingly. Posted in General, Life, Painting and tagged painting, Ravilious, war, watercolour. Bookmark the permalink. Thanks for looking at my work. For more detailed info about locations, etc, have a look at the books in my series ‘Ravilious in Pictures’ (Mainstone Press, 2009-12). Because I’d already published so much of that information I did not want to repeat myself, hence the more laconic captions to the paintings in the catalogue. One question: do your thematic sections mirror those of the Dulwich exhibition?